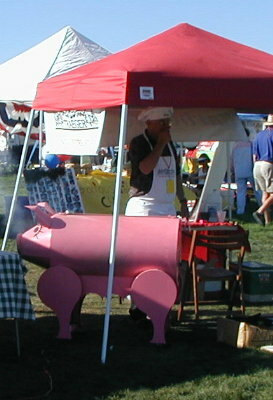 The CASI California State Chili Cookoff and Barbecue was held at Crusher Stadium in Rohnert Park on Saturday, October 13, 2001. It was a hot day in the Sonoma Valley; the temperature was above ninety, and hotter than that in the chili booths! 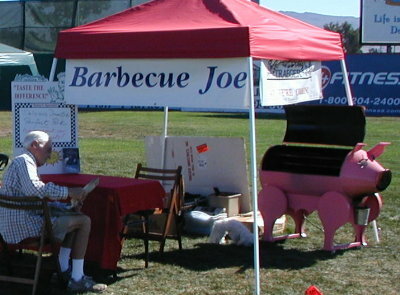 Barbecue Joe, his friend Howard, and Miss Piggy supported this event by offering hickory smoked pork loin tidbits and chicken leg drumsticks to the attendees free of charge. From four o'clock, when the gates opened, until seven o'clock, when we flat ran out of food, Barbecue Joe fed over five hundred people. Their reaction to food cooked on a Traeger Wood Pellet Grill was nothing short of spectacular. They also think Miss Piggy is cute. 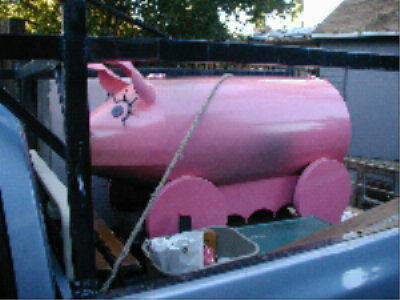 Here you see Miss Piggy loaded on the truck for her first road trip. She can hardly wait. Howard catches up on the day's news after we have set up the "stand." Howard did a great job by providing the truck and driving from Redwood City to Rohnert Part (and back!) He also helped cook and serve. Great job, Howard! 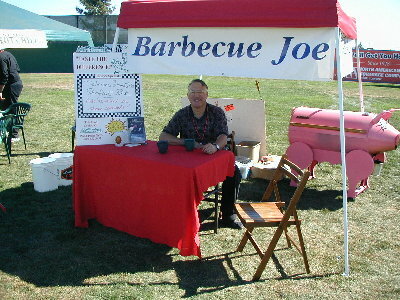 Barbecue Joe before the rush. It was one of the last peaceful moments of the day. 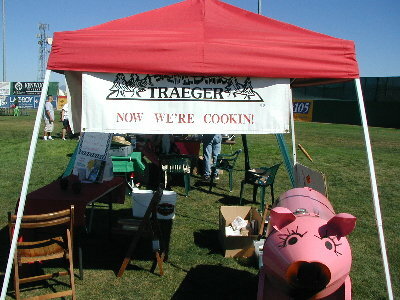 Front view of Miss Piggy, side view of the stand. The serving aisle and Barbecue Joe banner are to the left. The menu of the day. 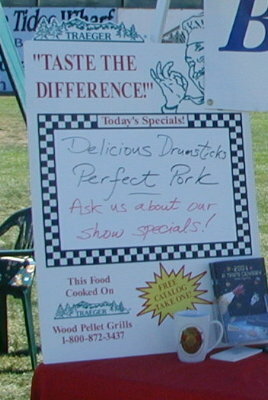 We fed about 65 people with drumsticks, and over 500 with pork loin tidbits on toothpicks. 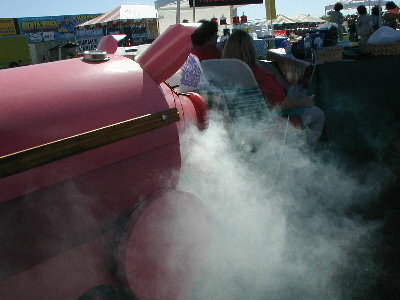 Here's Miss Piggy hard at work, smoking up a storm. People laughed out loud when they saw the smoke come out her snout. We told them: "Our smoke is no joke -- Wait until you taste the food." When they got done tasting, they stopped laughing. When the public arrived, we got really busy. There was not one break in three hours as people clamored to get our chicken and pork. Howard did get to take this one shot of me (from the back of the stand) in the process of feeding Miss Piggy. We had a great time and a tiring day. We will go back next year, and enter the barbecue competition.